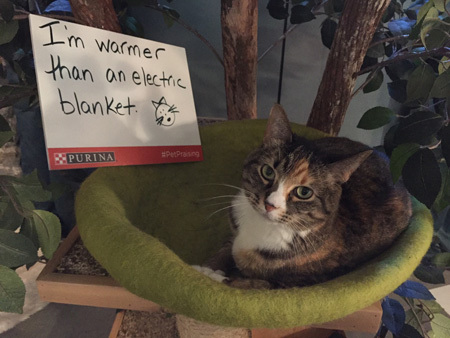 Catladyland: Cats are Funny: Share Your #PetPraising Pics With Purina and Win a Photo Shoot! Share Your #PetPraising Pics With Purina and Win a Photo Shoot! This post is sponsored by Nestlé Purina. I received compensation, but all opinions are my own. Catladyland only shares information we think would be of interest to our readers. It's National Pet Month, and Purina is doing their part by helping us celebrate what our pets do right. How many times do you say, "good kitty!" I know I must say it at least eleventy-billion times a day, along with such phrases as. "who's a good boy?," "who's the best kitty girl in the whole wide world?" We won't go into the voices that come out of my mouth while saying those phrases, but my guess is you use similar voices. Here's the part where Purina comes in and joins you in a pink cloud of pet-praising goodness. They're inviting pet owners (just like you!) across the nation to share their special pet pics. Take a photo of your pet with your unique pet-praising message -- similar to the one below of Phoebe. Share your photo on pureloveforpets.com. That's all you have to do. All photos submitted between April 26 and May 24 will qualify a professional photo shoot that'll be featured on RealSimple.com. How 'bout that? And while you're on the Pure Love for Pets site, take a peek around at all the ways Purina is celebrating National Pet Month, and check out the new products they have to offer.